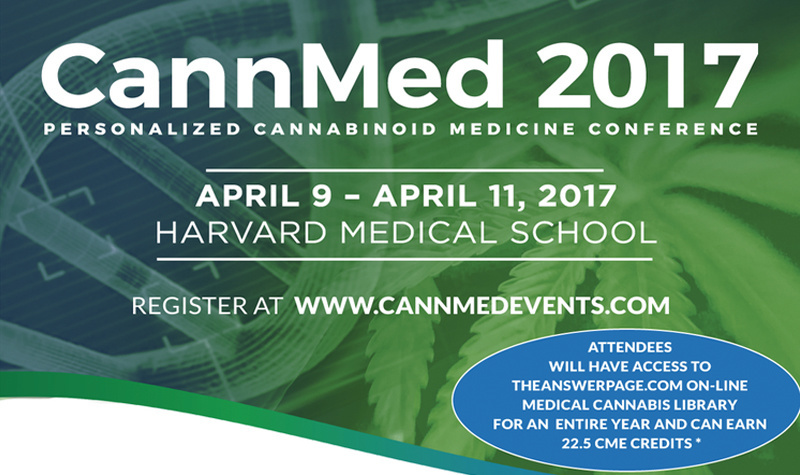 This past week the second annual CannMed Conference, held on the Harvard Medical School campus in Boston MA, was kicked off in appropriate fashion with a video presentation by Dr. Raphael Mechoulam, to whom the cannabis industry owes its continuing gratitude for his prescient deduction 50 years ago, linking phyto-cannabinoids to an existing endocannabinoid system of which we know so much but yet clearly so little. Dr. Mechoulam continues to conduct pioneering animal research into the many beneficial attributes of cannabinoids including cannabidiol’s mitigating treatment of graft vs. host disease, reducing the development of Type 1 diabetes and osteoporosis. He also postulated on the likely existence in man of scores of as yet defined amino acid derivatized endocannabinoids, including those synthesized by man using olive oil compounds as the starting scaffold. The benefits of a Mediterranean diet are becoming more clear! In spite of the barriers to conducting randomized clinical trial studies with cannabis in the US, Dr. Michael Dor, Head of the newly formed Cannabis Program in Israel has approved 30 clinical trials using cannabinoids, where forty percent of the MMJ patients have cancer and each are dispensed 20 grams of cannabis per month from strains of a particular ratio of THC to CBD. Dr. David Meiri at Technion in Israel has observed specificity in cannabis strain extracts across cultured cancer cell types, leading him to now look at 100 cannabinoids in each of the 80 strains used in Israel and the profiles vary greatly! US clinicians, Drs. John Gaitanis and Bonni Goldstein, shared their exciting results in use of cannabinoids to treat refractory pediatric epilepsy where THC administration can rescue patients in seizures within seconds. Cannabinoids are also providing hope for severe autistic children and their parents. The striking outcome of cannabinoid treatment of various cancers, where dosing can run from 100 mgs per day of whole plant extracts to micro dosing of 1 mg four times a day, is just astonishing. Dr. Sean McAllister of the California Pacific Medical Institute in San Francisco has shown that THC + CBD inhibits the chemotherapy induced neuropathy through dramatic increase in ROS (reactive oxygen species) to trigger cell death of cancer cells but not normal tissue cells. Yet complex issues exist surrounding the administration of CBDs in a hospital and/or school setting due to fear of Federal recrimination. Notable progress continues with the use of cannabinoids alone or in combination with opioids as a highly effective alternative to today’s alarming use of opioids in pain management that has only lead to soaring addiction rates, acknowledging that the problem with opioids starts in the doctor’s office and shockingly that opioids make pain worse. There have now been 22 out of 29 RCTs (randomized clinical trials) in the US showing that MMJ relieves pain. Dr. Sara Jane Ward of Temple University is using a mouse model for neuropathic pain to demonstrate that CBD treatment completely ELIMINATED the neuropathy. gene that cancer cells co-opt to allow for migration of cancer cells elsewhere in the body. And other scientists are looking at: the use of raw cannabis to avert the rapid development of THC-tolerance and the derivatization of cannabinoids, through hydrogenation or amino acid adducts to extend their half-life in vivo. Medicinal Genomics’ Kevin McKernan introduced a cannabis nomenclature system (CNS) consisting of bar codes based on only 29 SNPs (single nucleotide polymorphisms) to fingerprint cannabis in a seed-to-sale tracking system, enabling a decentralized network eliminating unauthenticated strain naming. McKernan likened the potential of this approach to a great renaissance in line with what has been witnessed when other efforts to decentralize has occurred whether it was the printing press taking away the cloistered role of church scribes’ limited ability to supply the written word or making information widely available on the internet instead of just in libraries or decentralizing currency from banks to the bitcoin. The future is bright and full of discovery. We can look forward to seeing phyto-cannabinoid findings from animal studies adapted to well-defined RCTs as required by today’s evidence-based approach to clinical outcomes. In addition, we need to develop an alternative path of acceptance in the medical field of whole-plant extracts for the treatment of chronic diseases that modern medicine has failed to remedy.